Professional mixed media artist, Pam Carriker, uses her own product line with Derivan to create art journal pages! You can use any kind of printed paper for this step. Let the journal page sing a song of your recent ideas & experiences! Adhere some collage material to the watercolor paper using Mixed-Media Adhesive and let dry. *Note: Try to use personal collage materials. A few items you might want to consider would be written letters, kids’ homework or office waste. This will add a more personal meaning to your pages! 2. Use Matisse Low Viscosity Gesso as a wash (1:1 :: gesso:water) to unify the collage. Be careful not to cover text that you want to show through. Use a sponge brush and Liquid Pencil Ink: Permanent to stencil a design on the background.I like using the Liquid Pencil for this because of the soft graphite-look that doesn’t overpower the page. Use acrylic ink spray bottles to spray over masks. Blend out spray with a baby wipes. To add a sketched face to the page, use a Face Map stencil and Liquid Pencil Ink: Rewettable. Use a stencil brush, Style Stix or even a makeup sponge to apply it over the stencil. Let dry. Use a blending stump to blend out the lines on the face. Liquid Pencil is real graphite, so it will blend using a stump much like a pencil sketch will. 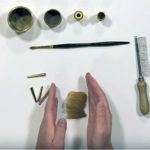 You can also use a kneaded eraser to blend and lift the Liquid Pencil. *Note: To intensify the shading, use a wet brush on the Liquid Pencil and move it around to your liking. Continue to add Sheer Acrylic paint (or very thin washes of acrylic paints) around design elements to help them pop from the page. 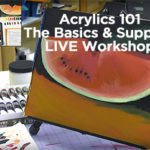 Use acrylic paint, sponge brush and stencils to add texture to the background. Use a stencil or draw a color wheel onto both the pages and onto a piece of paper. Cut out the wheel on the paper and adhere part of it to the wheels drawn on the page using Mixed Media Adhesive. Add watercolor washes and/or water-soluble pencil to the page around certain elements. In color wheel designs, let the paint puddle sit for a minute then blot with a paper towel. 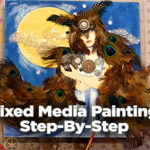 The Mixed Media Adhesive allows for fine media like watercolors and even sketching to be done on top of the collage background. Use a Faber-Castell Pitt Artist Big Brush Pen to color around objects on the page and activate the pens India ink with a wet brush, moving it around and let dry. It will be permanent when completely dry. Use Liquid Pencil Sketching Ink:Permanent and a stencil brush to pounce over a small stencil design. Add dots of Liquid Pencil Sketching Ink:Permanent direct from the nozzle tip to the gear element and let dry. Burnish all permanent Liquid Pencil to a sheen with a bone folder tool or a soft cloth. I love how the dots look like nail heads or brads. Use a pencil type eraser and erase areas where you used the Rewettabe Liquid Pencil to create highlights as I did here in the eyes. Liquid Pencil rewettable can be erased, lifted with water, blended with a blending stump and just about anything you can do with a regular pencil, with the addition to being able to use it like paint. Use Faber Castell Pitt Artist Pens to add finishing details and journaling. For more information, check out Pam’s YouTube video about this specific project!